WHAT IS IT? The Model LP is a low cost, highly efficient rubber bladed conveyor belt cleaner for use on medium speed belts. The belt cleaner mounts under the head pulley to remove carryback and return it into the discharge stream. WHY IS IT NECESSARY? The Model LP provides an easy way to maintain conveyor belts, decreasing costly downtime and material clean-up. 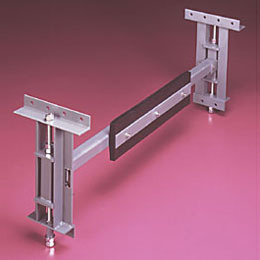 Sample model is LP-(belt width)(tensioner style), example LP-36S. For "Vise Grip" option, add (to the price) $2.50 per INCH of conveyor belt width. Add "V" to the end of the model number. For the optional 90 durometer urethane wiper blade option, add "U" to the end of the model number. Refer to price chart (above). The model LP belt cleaner is uncomplicated, durable, and effective. Standard 80 durometer rubber blade is 1" x 6" x belt width (inches). The unit is mounted on the conveyor by drilling (6) 9/16" diameter holes per side. After initial pretensioning, the spring loaded blade continues to adjust itself against the conveyor belt. Optional urethane wiper blade available, add "U" to model. Optional ratchet tensioner available, add "R" to model. Optional quick change vise grip available, add "V" to model. Optional compact side frames available, add "C" to model. Optional dual wipers blades available, add "D" to model.